Many users have the issues of low internal memory in their device. Due to which one can only install a handful of devices which now can be overcome with the help of below mentioned tutorial. At below we have guiding you how to convert the external memory into the internal memory in the Motorola Razr i smartphone. We strongly advice you to take backup of all your internal datas with the help of backup applications. Just in case, if you lost your datas due to any reasons, you could recover them with the help of backups. Disable all the antivirus tools in your device to avoid its interruption during the firmware update. First download the Package for Motorola Razr i from here to your computer and extract the same in your computer. After that connect your Motorola Razr device via USB cable and copy the same in your device. 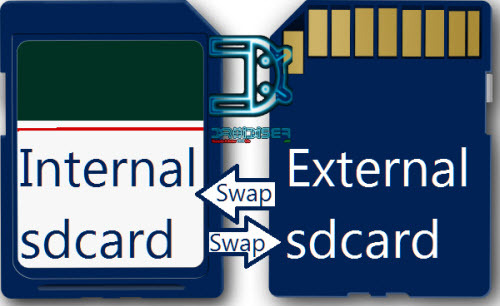 After that open the file which you named as “run.bat” file and then follow the on screen instructions for swapping the Internal and External SD Cards on the Motorola RAZR I. NOTE : Just in case, if your device doesn’t boot up or show the home screen then remove the battery and reinsert the same to boot the device again in the normal mode. If you get any force close errors you will have to select the options Wipe data/factory reset” & “Wipe Cache partition” in the recovery mode. That’s it you’ve done. Now you can install more apps and enjoy its features.